Heterogeneous systems are an important trend in the future of supercomputers, yet they can be hard to program and developers still lack powerful tools to gain understanding about how well their accelerated codes perform and how to improve them. Having different types of hardware accelerators available, each with their own specific low-level APIs to program them, there is not yet a clear consensus on a standard way to retrieve information about the accelerator’s performance. To improve this scenario, OMPT is a novel performance monitoring interface that is being considered for integration into the OpenMP standard. OMPT allows analysis tools to monitor the execution of parallel OpenMP applications by providing detailed information about the activity of the runtime through a standard API. For accelerated devices, OMPT also facilitates the exchange of performance information between the runtime and the analysis tool. We implement part of the OMPT specification that refers to the use of accelerators both in the Nanos++ parallel runtime system and the Extrae tracing framework, obtaining detailed performance information about the execution of the tasks issued to the accelerated devices to later conduct insightful analysis. 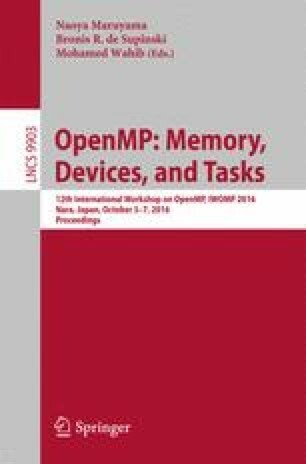 Our work extends previous efforts in the field to expose detailed information from the OpenMP and OmpSs runtimes, regarding the activity and performance of task-based parallel applications. In this paper, we focus on the evaluation of FPGA devices studying the performance of two common kernels in scientific algorithms: matrix multiplication and Cholesky decomposition. Furthermore, this development is seamlessly applicable for the analysis of GPGPU accelerators and Intel® Xeon PhiTM co-processors operating under the OmpSs programming model. This work was partially supported by the European Union H2020 program through the AXIOM project (grant ICT-01-2014 GA 645496) and the Mont-Blanc 2 project, by the Ministerio de Economía y Competitividad, under contracts Computación de Altas Prestaciones VII (TIN2015-65316-P); Departament d’Innovació, Universitats i Empresa de la Generalitat de Catalunya, under projects MPEXPAR: Models de Programaciói Entorns d’Execució Paral \(\cdot \) lels (2014-SGR-1051) and 2009-SGR-980; the BSC-CNS Severo Ochoa program (SEV-2011-00067); the Intel-BSC Exascale Laboratory project; and the OMPT Working Group.